Some readers have probably already seen our slow motion parakeet video, but hopefully you won’t mind checking them out again! 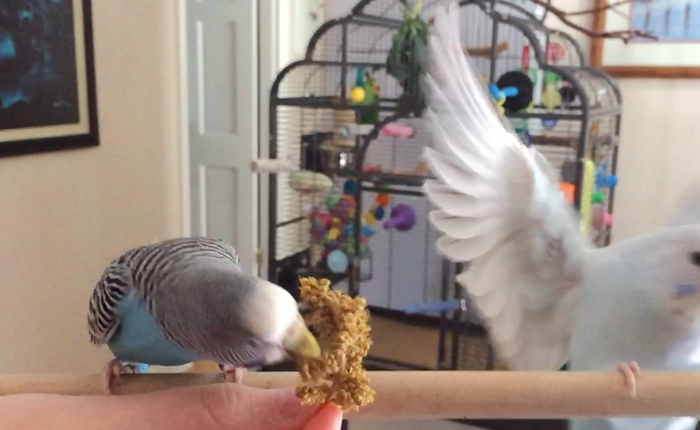 Using a perch and some millet as a lure we decided to try taking videos of the parakeets flying to us in slow motion. I’m pretty happy with the result. Note: Make sure to turn down your sound before watching, there’s a weird metallic noise that I’m trying to fix but in the interim I don’t want to hurt anyone’s ears! You can check out more videos of Toby and Kelly in slow motion (among other things!) on my YouTube channel. These videos were taken using my cell phone, an Apple iPhone 6 Verizon Wireless, 16GB, Silver , which I think is pretty amazing!